Traditional Shea butter has learned some new tricks. 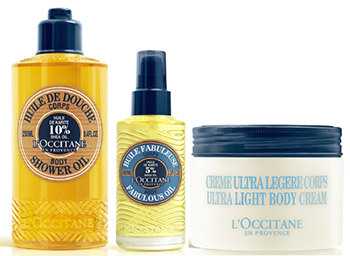 L'OCCITANE has stepped up the game by improving its existing line that takes body care to the next level. Three new star products Ultra-Light Body Cream, Shea Fabulous Oil and Shea Shower Oil. Our scientists are always working to optimize our ingredients, to bring more pleasure to your skin care, and better results. That's why we've taken Shea butter, one of our most iconic and effective ingredients, and brought it to you like you've never experienced it before - with a new look and feel that will spice up your body care. Step into the light, airy texture of L'OCCITANE's new whipped body cream. It delivers the same surge of nutrition you've come to expect from Shea, with an brand new nourishing experience that will delight skin. Shea butter has been used as natural care for thousands of years, originally by Burkinabé women to protect their hands and face from harsh conditions. Through a strong, committed partnership with these incredible women since 1980 and for more than 30 years, L'OCCITANE brings you the power of Shea with a modern touch. With innovative textures that envelop skin in a blanket of nourishing comfort, our line of Shea products honors the history of Shea and keeps skin smooth and nourished all day long. Here's hydration like you've never felt it before. L'OCCITANE's Shea Butter cream has been whipped into a light, airy formula that melts on skin, leaving a soft-touch finish that lasts. This new texture is a perfect match between a technology coming from food-processing industry and an innovative formula to successfully develop an incredible mousse-like texture that is both nourishing and light.